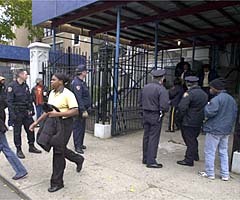 10/29/02 JERSEY CITY, N.J. – A student was shot and wounded inside a high school shortly after classes started Tuesday and a suspect was arrested nearby. "It appears that the suspect, who may not have even been a student there, walked in and shot the victim in the abdomen," Eason said. However, the gunman turned out to be a student who told police he was showing a classmate a gun in the basement of their high school Tuesday when the gun fired, striking his classmate in the abdomen, a school official said. The 17-year-old suspect was arrested near Lincoln High School about a half hour after the 8:30 a.m. shooting. According to Superintendent of Schools Charles Epps, the shooter told police the small-caliber handgun accidentally fired. The wounded youth, a 16-year-old boy, was taken to Jersey City Medical Center for surgery, Mayor Glenn Cunningham said. The injury was not believed to be life-threatening, said Brian K. Dorf, a spokesman for the mayor. Classes remained in session, but some parents took their children out of school. Nancy Wilson said she learned of the shooting from a cell phone call from her daughter, Jasmia Wilson, 16, a sophomore. "Thank God she's got one. Nobody notified me," Wilson, 33, said. She said Lincoln is plagued by undisciplined and unruly students [Bully Stops when Respect Begins]. "There are not only fights in the hallways, there are fights in the classrooms," Wilson said. School Guards use wands to check students for weapons at random, but obviously missed this one [Crisis Readiness Training]. The Superintendent reports that they are considering whether metal detectors should be installed and more police assigned to the school. This incident coincides with the sentencing of 4 teenaged students from another New Jersey school for a brutal sexual assault of a 13 year old middle school student. The 17 year old leader (see the Potentially Dangerous Student) of the attack punched, kicked, slapped and held down the young girl while others sexually assaulted her. He then sexually assaulted her. His attorney pointed out that he had difficulty with anger [Anger Management/De-escalation Training] since being struck by a car in the first grade, was in special education classes, was abused as a child and was raped in the 6th grade. The Prosecutor countered with, "This is a heinous act on a 13-year-old girl. Consider the severe impact it had on the victim and her family." It was widely reported that Juvenile Crime was on the decrease just a year ago. Many schools and parents had relaxed because of these reports. However, newer data suggests that violence remains a difficult problem for young people worldwide. Vigilance must be renewed and maintained to protect our children, our students, from this violence. If you are concerned and need information, ideas or direction please contact Keys To Safer Schools.com today. Keep checking here for more update information. Friday, November 1, 2002: While the Police and School Administration were still sorting out the shooting above, 3 students from Snyder High School were gunned down today on their lunch break. It appears that a fight started on school grounds then spilled over to the street as students left for lunch. During the fight, one boy entered a building and returned with a 9mm handgun. He fired several shots into the crowd leaving 3 students wounded. Police have a 18 year old male in custody who was not a student and are still searching for a 17 year old student. Parents, students and officials are having difficulty coming to grips with the recent shootings. Visit the Keys website for valuable information and resource material on school violence prevention at http://keystosaferschools.com.